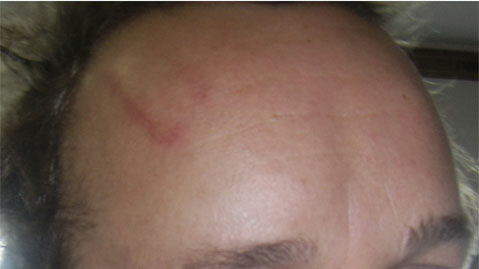 A large bruise (hematoma - marked by arrows) seen 2 hours after this footballer from the Highett Football Club was kicked on the right temple during a game. Wheatgrass cream was applied immediately after injury. No ice was used. The swelling was originally very tense and blue, but when this picture was taken, it had already softened and the dark purple-blue discoloration almost disappeared. The following day, (less than 24 hours after the injury) the swelling has virtually disappeared leaving only the skin abrasion where impact occurred still visible. The Head Trainer of Highett Football Club, Malcolm Matthews estimates that since a wheatgrass-based cream was introduced to the Club, recovery rates for hamstrings and other muscle injuries, groin strains, abrasions, blisters and many other injuries have improved by at least 30 percent. Malcolm is happy to share his wheatgrass healing experiences with anyone who is interested. Please call him on +61 0429 171 171. This is an excellent example of how quickly wheatgrass can stop bleeding under the skin and in deep tissues thereby reducing the swelling of traumatic injuries. If this simple, inexpensive method of contusion management was widely used, post-traumatic swelling and therefore injury recovery time could be dramatically shortened. The potential uses for wheatgrass as a first-aid application are numerous. For instance, sports injuries, motor vehicle accidents, before and after surgical procedures and operations, falls in the elderly, school playground injuries and so on. It would prove invaluable in every ambulance, hospital and doctor's office, home, office and glove box.